SWG-A Frozen Showcase - Lifco Technical & Trading Co.
Three basic specifications: 1875mm (three doors), 2500mm (four doors), and 3750mm (six doors). Can be jointed together to suit your length requirements. Combo has been specifically projected for large-scale distribution. 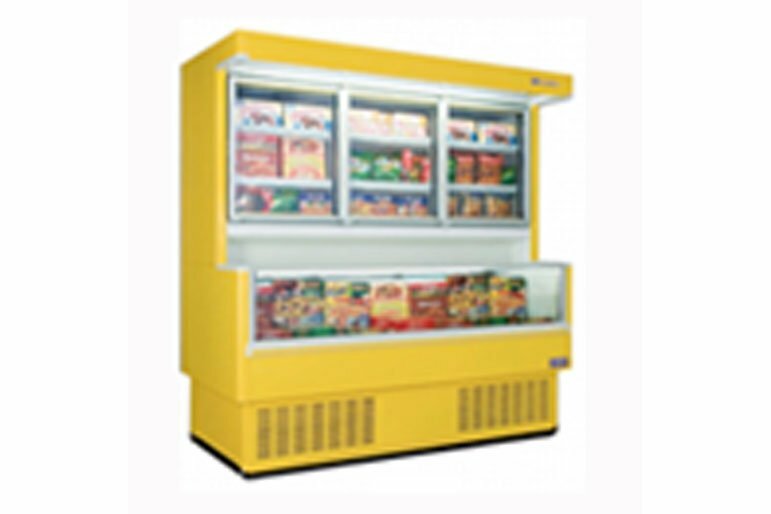 Constructed with great accuracy, it is supplied with all the newest technological devices, which give the counter a high efficacy in the preservation of the frozen food and ice cream. Combo has a large loading capacity and is available in two different heights (2250-2040 mm), it is modular (1875-2500-3750). *The supermarket space is used well. Compared to common island showcase, its occupied area is less 50%. *The low investments, only one time invest, but get interest life-long, the running cost lowed, can save energy 50%. *The design of heating with electricity antifogging glass door is used, the glass door is closed automatically, so that can be save energy and reduce consumption. *The multiple decks can be combined freely, their angle can be adjusted, thus the display effect is increased. *The lampshade, lamp holder and flat-end are choose on the top, can satisfy all kinds of display demand. *The main feature of Combo is its capacity to enhance the presentation of the displayed products.